Hawthorne Cat, the exclusive Cat equipment dealer in San Diego, the Hawaiian Islands, and the Pacific Region announces Level 1 Operator Training Courses, designed to help your company improve productivity, decrease downtime, reduce operating costs and enhance safety. “Good operators are able to move the most material in the least amount of time,” says Lyons. Are your operators using Cat® equipment safely and reaching their fullest potential? Hawthorne Cat, the exclusive Cat equipment dealer in San Diego, the Hawaiian Islands, and the Pacific Region announces Level 1 Operator Training Courses, designed to help your company improve productivity, decrease downtime, reduce operating costs and enhance safety. Hawthorne offers courses in three levels and custom-designed courses to match each operator’s level of experience and project needs. 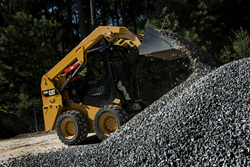 Each course includes classroom instruction, simulator training and hands-on experience with Cat machines, including Backhoe Loaders, Excavators, Mini Excavators, Motor Graders, Skid Steer Loaders, Track-Type Tractors, and Wheel Loaders. Curriculum ranges from operator foundations to advanced training for specific job site needs. Participants become expert in safety, maintenance, controls, and procedures when operating the latest Cat equipment. Upon successful completion, each student operator receives a certificate and verification card. For an updated list of upcoming Level 1 Operator Training Courses, visit the Hawthorne Cat website. For more details, contact Ron Lyons at 858.674.7047 or rlyons@hawthornecat.com.